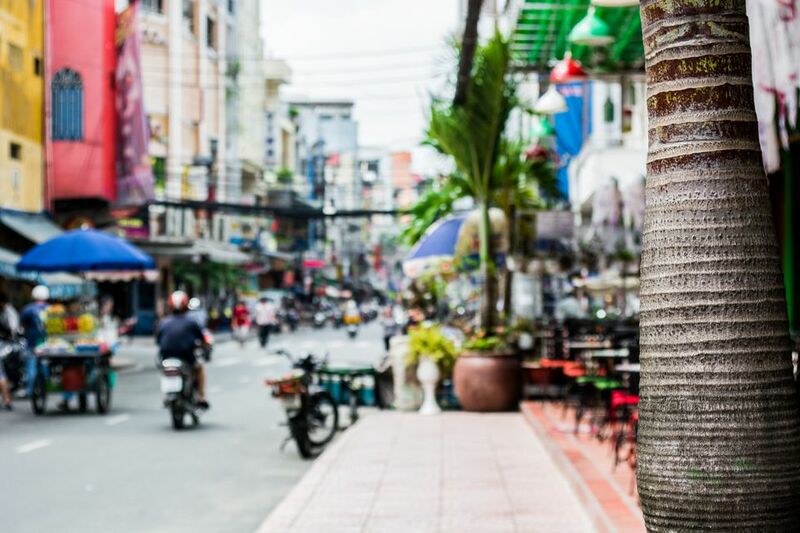 Known as the “backpacker district” or the “budget travel district,” Pham Ngu Lao is a convenient place in Saigon to find cheap accommodation, food, nightlife, and to book tickets elsewhere. Slightly reminiscent of the famous Khao San Road in Bangkok, many budget travelers spend most of their time in Pham Ngu Lao. With nearly everything that a traveler needs and a centralized location within the proximity of markets and attractions, Pham Ngu Lao is the perfect base for exploring the heart of Saigon. The Pham Ngu Lao area is made up of two parallel streets – Bui Vien and Pham Ngu Lao – and a handful of small connecting alleys. Located centrally in Saigon's District 1, the area is perfect for access to parks, markets, and the major sites around the city. Tiny alleys radiate from these main streets into the area's interior. These aren't your typical grimy crime-infested alleyways; ordinary families live in the residences lining these alleys, and it's not out of the ordinary to walk past an open door and see families gathered around the TV eating their dinner. Most things to do in Ho Chi Minh City are situated a short walk northeast of Pham Ngu Lao. The Reunification Palace, Notre Dame Cathedral, and War Remnants Museum can be reached on foot in around 15 minutes. A ridiculous number of budget accommodation options exist within Pham Ngu Lao. Travelers can benefit from all the competition; room rates can usually be easily negotiated. With cable television, refrigerators, balconies, and free Wi-Fi, rooms will seem a little luxurious to the average backpacking traveler! Always check for signs of bedbugs, particularly at the cheaper places. With such an array of available accommodation in Pham Ngu Lao, there is no reason to settle for a dirty room. While hotels and hostels can be found along both Pham Ngu Lao Street and Bui Vien, the best deals on rooms come from hotels off the main track. An unnamed budget hotel alley connects the western end of Pham Ngu Lao Street with D.Q. Dau Street; great deals can be found at the myriad of hotels along the narrow passage. The nondescript alley is marked only with a gray sign above the entrance printed with the Vietnamese names of several hotels. Another, wider mini-hotel alley connects Pham Ngu Lao Street with Bui Vien; restaurants and hotels compete for real estate along both sides of the street. Carts selling baguettes, street food, and even kebabs are scattered around both Bui Vien and Pham Ngu Lao. Pho24, as well as several independently owned pho eateries, stay open around the clock for anyone craving a bowl of Vietnamese pho noodle soup after a night out. Several Western-owned establishments offer up a pizza of varying quality, Italian food, and all the usual backpacker fare. The restaurants found in the wider of the two mini-hotel alleys have tables outside and serve large portions; cheap beer prices keep them perpetually busy. Water, snacks, and groceries can be purchased for cheap from one of the many Co-op Supermarkets scattered around town. Lacking any pleasant communal space, most of the budget hotels around Pham Ngu Lao have less charm than the average hospital. Backpackers seeking cheap alcohol used to enjoy a beer on the sidewalk, particularly along Bui Vien (the former “Beer Street”), but a recent crackdown has eliminated most of the sidewalk beer business. Allez Boo Bar: laid-back cafe by day, raucous party venue after dark. 187 Ð Pham Ngu Lao St, Dist. 1, Ho Chi Minh City, Tel: +848 3837 2505. Both Pham Ngu Lao and Bui Vien are lined with travel agencies offering trips to the Cu Chi Tunnels, Mekong Delta, and bus tickets toward Hanoi, even as far away as the Angkor temples. Local attractions such as the Vietnamese water puppet show can be booked by you directly at the theater to save on commissions. The high concentration of tourists in Pham Ngu Lao attracts a higher concentration of scams, touts, and thieves looking to exploit travelers. A majority of people who approach you are generally looking for a way to relieve you of some additional money; be friendly but stay on guard. By Taxi: Fixed-rate airport taxis charge around $12 to Pham Ngu Lao, however, you can get a better deal by walking out of the airport and flagging a taxi from the lot across the main road. Keep your luggage in the cab with you for a quick exit in case there is a dispute with the driver. By Bus: At around 30 cents per ride, the airport bus is the most economical way to get to Pham Ngu Lao. Unfortunately, figuring out when and where the bus will arrive is difficult. Lucky travelers will find the bus in front of the airport, otherwise you can walk five minutes to a small bus terminal just outside of the airport - ask for directions. The bus circulates through Saigon and stops at the Ben Thanh Market - only a short walk from Pham Ngu Lao. The last airport bus runs around 6 p.m.